Being a video creator on YouTube (YT) is a remarkable way of getting paid for doing something you love. However, similar to most things in this life, your success will largely depend on your willingness to put in the effort, time and dedication required to transform your YouTube channel into a working success. In the early stages of planning your channel, the money-making aspect should not be your main focus. This is because earning money will not happen quickly. The aim should not be to upload a few videos and hope one will go viral. To begin, it is worth learning the foundations of being a successful YouTuber. This includes uploading high-quality content on a consistent basis to help with growing your channel. When you have arrived at this point, your channel can be effectively monetized. This is literally how it works; creators are not allowed to turn on monetization until their mettle has been proven. Watching jerky, shaky video footage is not fun for anyone; therefore, you should think about acquiring a tripod. If your preference is handheld footage, try using a lens that has optical image stabilization or a wider lens. Your viewers want to clearly hear what is happening in the video. As such, you should be mindful of noises that could impact audio quality and work to minimize background sounds. Over time, you can always buy better equipment. However, if starting a lucrative online career is your aim, it is important to have what is necessary to deliver a pleasant watching experience. To grow your YT channel, you will need to communicate with your audience and consistently upload videos. Whether you opt to post content daily, a few times a week or once every fortnight, your objective should be to form a reliable schedule. As time passes, you will get the knack for perfecting your creative process. Now is the time to take note of how you are moving from conception to completion of the content for your channel. Undoubtedly, all your content should have a unique edge; however, the overall tone and style of your brand should remain the same. Having in-depth knowledge of your brand will assist you in creating more honest, more passionate and more authentic content. If you are just launching out, a crucial step involves cultivating and defining your brand. However, even established brands could do with some amount of clarification from time to time. Do an introspection and ask yourself some essential questions regarding your brand identity. What are you? What is your content about? Which audience are you attempting to reach? What are you trying to achieve with your brand? If you are not knowledgeable about your own brand, you cannot expect an audience to get it. It is vital that your audience receives value from your content. This has a remarkable bearing on whether your YouTube channel will grow and on your subsequent income opportunities. In essence, ‘valuable content’ is used to describe videos that provide the viewer with an emotional reaction. There are many ways in which creating value can occur. The possibilities include teaching something to your audience. In this case, the content value would be that individuals can learn to do something new or gain more knowledge. If your content makes the audience laugh; it value becomes in its capacity to supply a sense of escapism and entertainment. Strive to create valuable content that provides your viewers with something they have never experienced before. Ultimately, only good content will make you a considerable income; being second best will not earn you lots of money on YouTube. Some useful analytics are offered by YT in your Channel menu. You will be able to identify the gender, age, watch time and geographical location of your audience. Additionally, you will be able to see the number of views each video receives and how your videos are being discovered by viewers. After your channel has been monetized, you will be able to view ad performance and estimated earnings. These tools assist you in seeing the videos that are resonating with the audience and the ones that are not. If your videos are not attracting the right viewers or the right quantity of viewers, you will know the steps to take to improve your channel. Starting a profitable channel involves sticking to your passions. Success on YouTube is most often realized by creators who create passionate content for a niche group. Determine what your “thing” is; that distinct thing that is unique to your videos. Pour out your heart, be sharp emotionally and create the content you enjoy. Your authentic zeal will be one of the most powerful means of appealing to and growing a devoted audience. If your aim is to become successful at making money on YT, connecting with the audience on a personal level is extremely essential. This involves building a community and engendering higher levels of engagement. Audience engagement does not have to be particularly time-consuming or complicated. You can simply interact, ask questions and be as active as you can. Engaging with your audience will promote long-term growth by creating an atmosphere of the community for your channel. 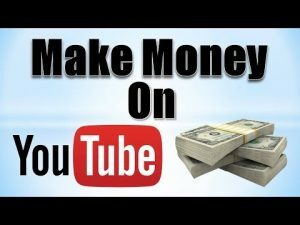 Creating content to generate an income on YouTube involves making an upfront investment. You will have to devote a lot of energy, time and other resources into creating this content and in the initial stages, it is highly likely that they will not perform that well. In reality, YT normally will not acknowledge your channel until you have uploaded approximately 20 videos. A number of individuals fail because they are not devoted to putting in that type of upfront investment. They crave an immediate return and when the level of commitment required is realized, they simply give up. If there is only one thing you take away from these guidelines on how to make money on YouTube, let it be this: investing in your channel is tremendously vital. An increasing number of individuals are using YouTube as a means of promoting their brands, growing their audience and earning a decent living. If you pour your heart, soul, energy and time into creating your content, you will quite rightly want the opportunity to make money on this successful platform. As such, you have to realize the importance of consistency. In addition, you should make sure your production quality does not take away from the otherwise valuable content.